Ptilosarcus gurneyi (with a striped nudibranch) off Whidbey Island, WA; photo by Jan Kocian. Like its slender cousin Stylatula elongata, the Orange Sea Pen (Ptilosarcus gurneyi) is actually a colony of tiny animals called polyps working together to form a single organism. It starts out as one primary polyp that grows and expands to form the base (the bulbous part that anchors the animal in the sediment) and the rachis (the central stalk). As it grows, it adds more polyps, assigned to different jobs depending on their location in the colony. A close-up of a preserved Orange Sea Pen showing the gastrozooids (feeding polyps), siphonozooids (pumping polyps), and rachis (central stalk). On the sea pen’s long feathery leaves are rows of autozooids: feeding polyps that wave their eight tentacles in the water to catch drifting plankton. These polyps pull double duty, also responsible for producing eggs and sperm that get released into the water column. 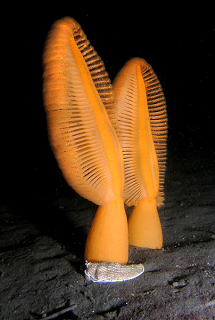 The siphonozooids, or pumping polyps, are found in the orange regions on the sides of the rachis. Their function is to take in or expel water, allowing the colony to inflate or deflate. The Orange Sea Pen is surprisingly mobile, inflating its siphonozooids with water and drifting like a leaf on the wind when it wants to relocate. It can also deflate, partially retracting into its fleshy base when predators come calling. The amount of retraction has been shown to be specific to the approaching predator, which suggests that the pen can actually sense who is creeping up on it! Unfortunately, even a retracted pen can have some soft tissue exposed, and the sea pen’s predators are determined – and hungry. Orange Sea Pens make up one of the largest sources of food on the open sea floor and are important to a wide variety of benthic predators, including sea stars like the Leather Star, the Common Sun Star, and at least three different nudibranch (sea slug) species. Luckily for the Orange Sea Pen, making a run for it and hunkering down aren’t its only defenses. When the pen is physically disturbed, it can bioluminesce, producing a greenish-blue light that runs up and down its stalk and startles predators. It can also produce a mild toxin called ptilosarcone, although the function of this substance has not been well studied. Young sea pens are especially vulnerable to predation. They are incredibly slow-growing, taking over a year to reach about an inch tall. Orange Sea Pens increase their chances of survival with sheer numbers - a single pen can produce about a million eggs during its 10-year lifetime. Read more accounts of Puget Sound benthos on Ecology's blog Eyes Under Puget Sound or find a full list Puget Sound's benthic invertebrates on the Encyclopedia of Puget Sound's Species Page. Dany Burgess and Angela Eagleston are benthic taxonomists who identify and count the benthic (sediment-dwelling) organisms as part of the Washington Department of Ecology's Marine Sediment Monitoring Program.